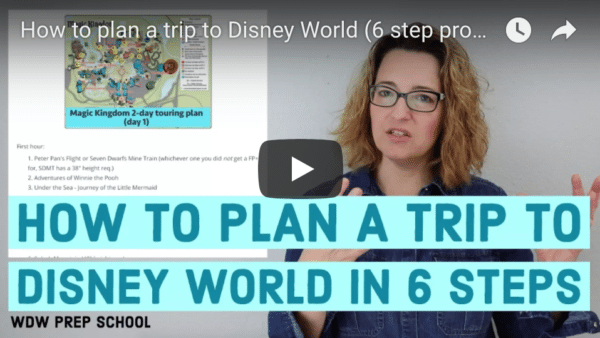 Lots of people dream of a trip to Disney World but aren't sure how much money it will take to get there. Asking how much a trip costs is almost like asking how much a house costs - it just depends. Let's take a look at different budgets and see what you can do with each. Let's just assume we're talking about a family of 4 with 2 adults and 2 kids under 10 who live in the middle of the U.S., which is both cliché and a bit narcissistic since that describes our family on our first Disney World trip, but we have to start somewhere. If driving, check out GasBuddy.com to help compute road trip costs. If flying, check Hopper's Airline Fee Calculator to help you budget. If flying and staying offsite, be sure to factor in rental car or car service costs. If flying and staying onsite, you can use Magical Express to get from the airport to your WDW resort for free. The decision to stay onsite vs. offsite should include more than just costs. Be sure to consider all of the benefits of staying onsite before booking your trip. If staying onsite, use Mousesavers charts for 2015 and 2016 to help you figure out nightly rates. 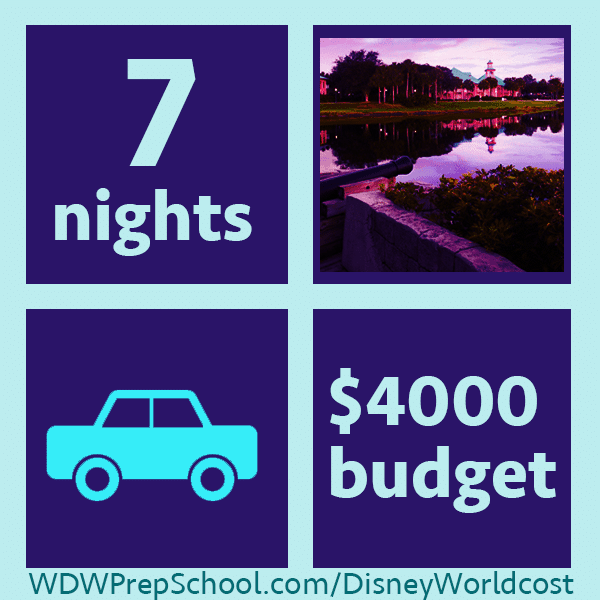 If staying offsite, be sure to add in any resort or parking fees (for parking at the resort and at Disney World) when budgeting. If staying offsite, consider using Priceline to bid on lower rates, but check this listing for hotels available through Priceline before you do. Check my park ticket comparison chart for prices from various ticket sellers. Keep in mind that kids under 3 won't need park tickets. Use my Disney Dining Plan charts as a reference for meal prices. Kids under 3 can eat free. Below you'll find what each budget will get you. Keep in mind that these are full prices that don't include promotions (except for the Free Dining example). Most people get discounts. You can check the 5 year history of discounts to see what is likely for your trip dates. Scroll down or jump right to your budget. 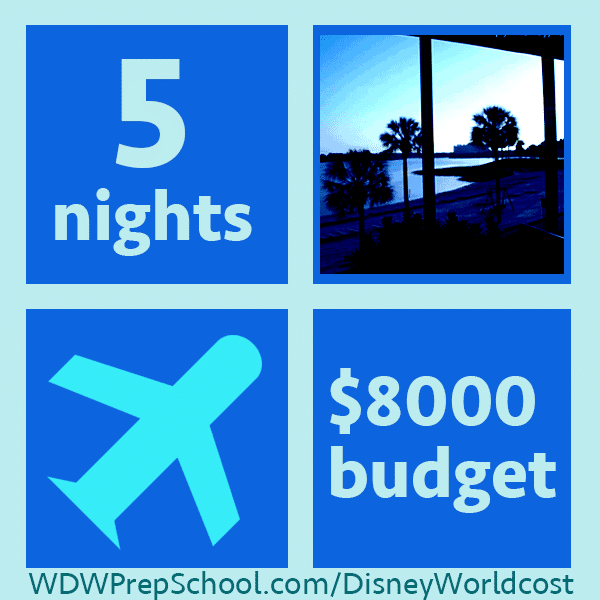 Going to Disney World at this budget won't be easy, but it could work in some situations. 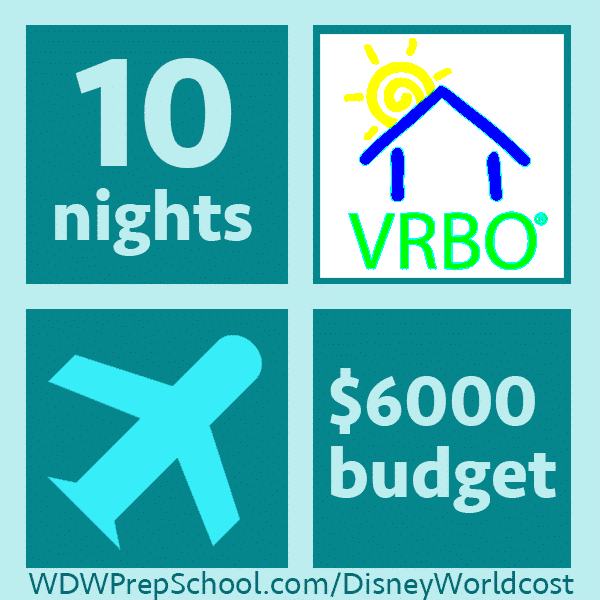 This is probably the lowest reasonable budget I'd consider for Disney World trips. In the examples below, notice that transportation and park ticket prices stay the same even when the number of days changes. If you're staying somewhere that's relatively inexpensive and not eating out all the time, you can often extend a trip from 4 to 7 days for very little money. At this budget, we can start to have a little more room to eat in restaurants, fly instead of drive, or add a special experience to the trip. At this budget, you start to get into more of a Deluxe-level trip with better hotels and special touches. At this level, Deluxe and longer trips are even easier. Throw in some magical touches for an extra special trip. Souvenirs/spending money: $2000 for extras like VIP tours, fireworks cruises, spending money, etc. Again, these prices don't include any discounts so it's possible to fit even more into your budget if a promotion pops up. Want to share a trip budget you've come up with? Copy the format below into the comment form and fill in the fields so we can see even more ways to put together a trip. 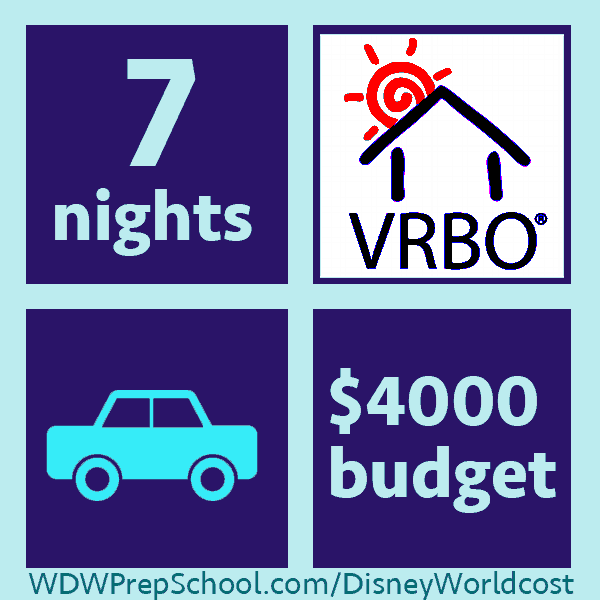 Most enthusiast families admit to spending around $1000/day to appease their WDW appetite, but a family of 4 could take a $3000 trip for 5days/4nites and have a koolaid drinking awesome experience for under $150 per person/day if they seek good values on lodging & food choices. You are looking at $200-$300 a nite for a value resort or good price at a moderate. 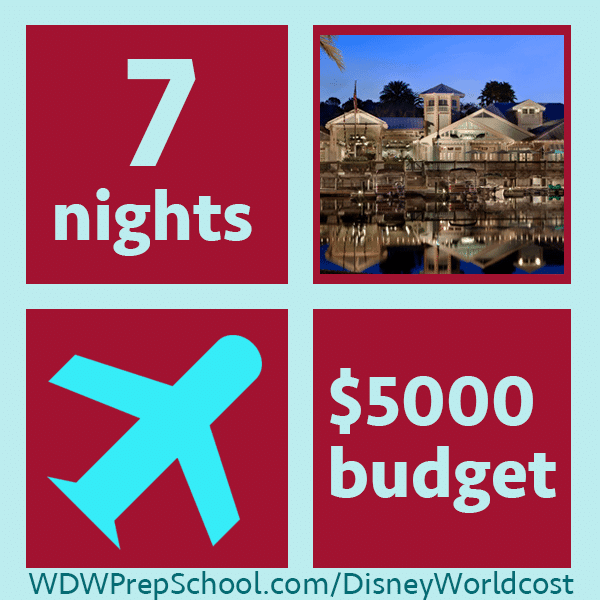 A decent expectation would be $400 each for 6nites/7days reservation. Hello wdwprepschool!! I have a few quest hoping you can answer.. I’m flying Into Orlando Sunday morning July 23 @ 4:45 am with two adults and two kids ten and two years old. I’ve booked a room for 5 nights at Wyndham garden lake Buena vista Disney springs resort for $356 is this a smart move compared to staying onsite and spending twice as much? What do we do at 5 am to get to our hotel with a 4pm check in time? Rent a car and wander, eat breakfast lol? Other ride alternatives with suitcases and car seat? So sorry it’s so long hope someone has suggestions one week to date I’m so excited! Dining reservations: 250…that’s a rough estimate..3 restaurants. All in all, we will probably be in about 5k after it is all said and done. Thank you so much for all of the wonderful tips! You have made planning this trip so much easier. Driving to Orlando; 2 adults with 2 days at the parks over Thanksgiving 2016. I did pay about 60 bucks for memory pics after the fact. We didn’t get the memory maker. Probably worth it for a longer trip. this was our first trip in years and we wanted to see how cheap we could do it…. we did eat two nice meals at the parks and some other nice dinners including one at Disney springs. We also had mucho drinks at Epcot. Cutting out food and drinks could bring things down. I was just wondering how much will it cost to go to Disney world for a family of 30? 14 kids 16 adult. Planned my own WDW trip 8 weeks in advance for my mom, me and my daughters first time in late October 2016. I really wanted to stay under $3000 and I was able to hit my goal. My daughter was 2 at the time (she didnt turn 3 until after we got back from our trip) so she didnt factor into theme/party tickets and meals. After writing it all out I see places where I can save even more money (taking my own food into the parks/buying costumes, ears etc before coming to Disney/only going to the Halloween party once lol) but was the MOST amazing time I could ask for and this site made my planning soo much easier! Thank you Shannon! PS: we LOVED the halloween at WDW and weather so much we are making it a yearly trip during this time! Going with my husband in May 2017 for 6 nights! It’s his first trip so I’m spending more than I probably would if it weren’t. Family of 4, 2 adults 2 kids (one under 3) going in November 2016 for 5 nights. We lucked into an extremely affordable trip, but I’ll share how much it would have cost as well. Flights are “free” & booked due to airline miles. bags are free due to having a united credit card. What am I missing? Is $1,000.00 enough? My kids are 2 & 3. 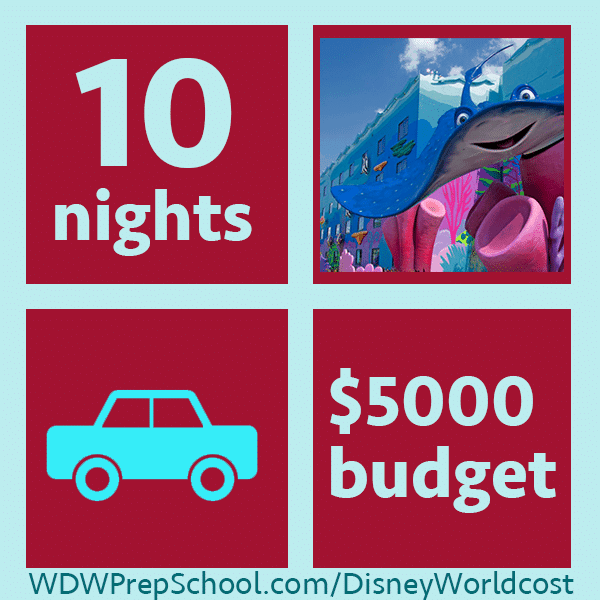 Forgot to mention 6 days of park hopper tickets included in the $4110! I found this to be off for us personally. We had to include costs of driving 3 hours to the airport (and driving home from the airport) with gas and tolls(luckily my m is driving our van home and back up so we don’t have to spend hundreds on a rental plus carseats rentals), a 3 hr flight for four both ways, 6 nights at coranado springs with park tickets for 5 days, and the deluxe dining plan. What I would encourage anyone to do though is factor in tips and taxes on everything. We planned many table service meals that require tips, plus mousekeeping, checking luggage, tipping for luggage, etc. I guess maybe I find these to be way off. 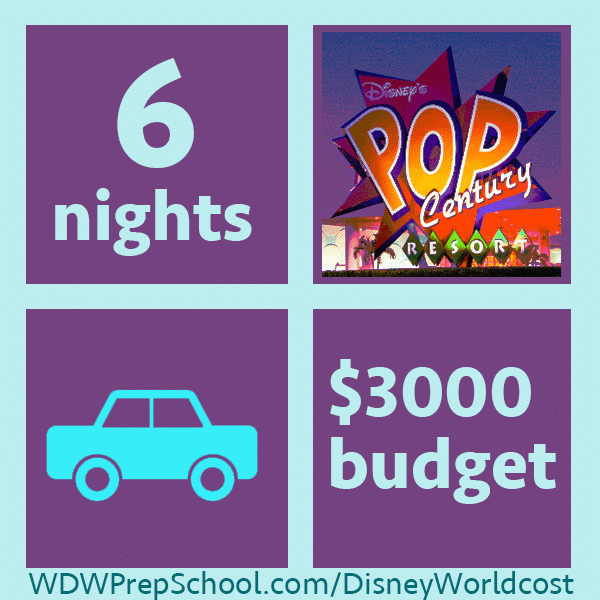 We have spent 4,230 with trip insurance for an 8 night stay in pop century Oct 20-28th of 2016. this includes park hooper+water park, the disney dining plan with table service and quick service and memory maker. When we add in the flights i have found for 1000.00 we are only looking at 5,230. For all 3 of us to go. So i feel like these are a bit off. i mean why not show the value resorts. We would rather do value and have more money to spend on things in the park. I have 5 adults ,and 4 grandchildren two who will be 5 and two who will be 2 in April of 2018. I have never been to WDW and feel my first experience will be shared greatly with our children and grandchildren. I will be graduating from college in Orlando at that time. What clubs should I join to help my family be able to afford at least a weekend stay off site and still enjoy the theme park for 2-3 days? All Sincere help will be welcomed! In my humble opinion. Nobody does it like disney and their Christmas decorations are nice. Your value sense it going to be mostly taxed by lodging and food. Resort lodging is a categorical rip off and eating on site follows close behind. Minimize those those two things and that will go a long way to help your value sense. Also pay attention to crowd statistics…. that will go a long way to aid your pleasure meter. Crowds are the quintessential buzz kill and watch the weather (temperature stats). I may be one of the few people that put a number on things in terms of “value”. When it’s all said and done…. what number would you like too see vs what you experienced. To some… that number is high…. 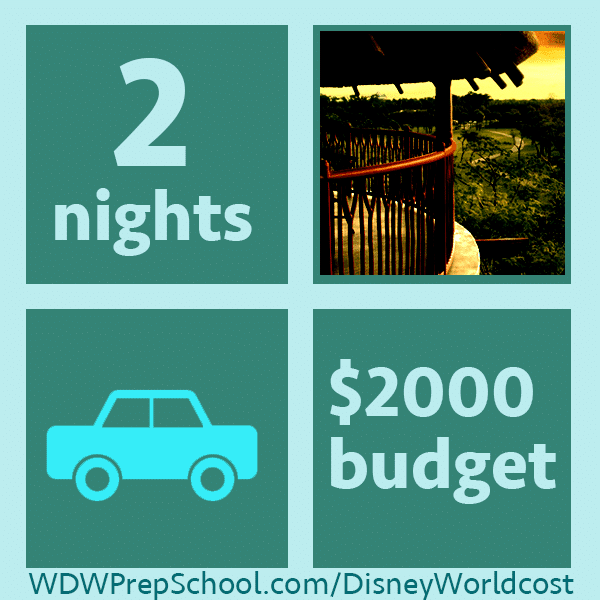 you can spend over $20,000.00 for a week at Disney… I couldn’t imagine. Is your number $2k, $4k, $6k, more? I’d be hard pressed to say that $2k for two people is worth it. So many people get dreamy…. we had a private tour of Egypt with our own Egyptologist….. that trip was almost $20k…. was it worth it…. nope. We joined a pretty awesome travel club that has TONS of Disney trips (Disneyland and Disneyworld). We just booked march 14-17th 2016 3 nights 4 days at Disney Paradise Pier Hotel with 2 day park hopper passes for 3 of us, $180 Disney dollars, 2 adults one child = US$1190 + our flights. SO EXCITED!!! Would you mind sharing the name of the travel club you booked with? That’s a great deal! If I could get a deal like that we could go (we are also a family of 3) in 2017 instead of waiting another year or two. We went in the off-season- September 2015- for our honeymoon! We spent 5 days and 5 nights. We had the Deluxe Dining Plan and used park hopper tickets- and flew all the way from Idaho! Total cost? $1,569.23!!! We are hoping to go again in May and stay in a DVC rental. We’re currently on a budget of $2,500. I will say though, that there’s only two of us, and that brings the cost waaaaay down. ◾Lodging: Rented DVC points from my sister. Animal Kingdom Lodge for 5 nights was $690.00. 58 points at $12/each. I love this post. 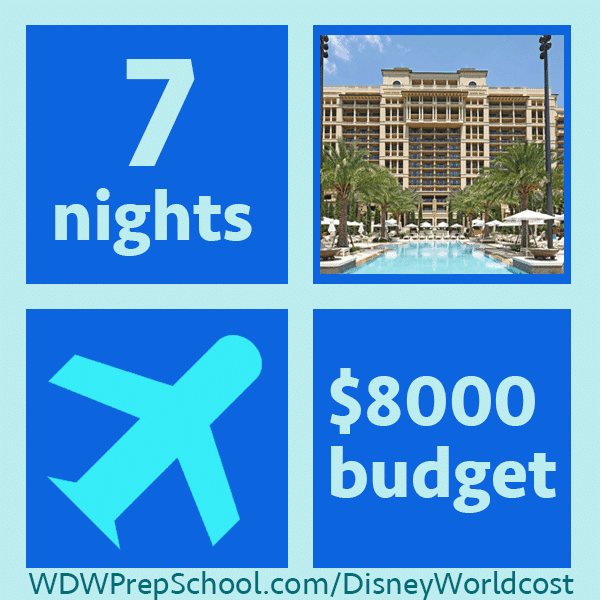 I think so many people think you have to have thousands and thousands of dollars to go to Disney World, but it can be done with a very reasonable budget. We are spending 6 nights at All-Star sports with free dining and 7 day park-hoppers for $2200. I think I paid about $250 to upgrade our dining from only QS to include 1 TS each day for character meals. We are driving and visiting a friend for a night along the way. We planned everything back at June on a whim to celebrate our daughter’s 7th birthday next month. Next year I would really like to stay at Wilderness Lodge for 6-7 nights, but we’ll see. We haven’t even been this year and we are already planning for next year. The Y.E.S. Program prices for 2016 tickets have increased. (Hardly a deal anymore) They actually charge more for the adult attending the program than a regular park ticket. The only way this might still be a good deal is for a group of older children that don’t require adult attendance bc you would save on not buying an “adult” ticket and be getting a discounted yes child ticket. We are DVC Members and get outstanding value from our membership. In the past my wife would tag along with me when I was on an Orlando business trip (sometimes at Walt Disney World!) to save money. Other times we booked to get the free meal plan f possible and stayed at Deluxe Resorts. 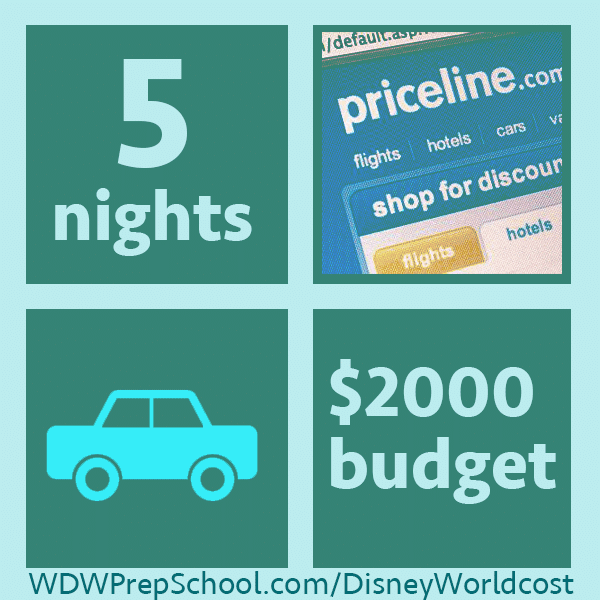 It only took a few times to realize that we wanted to continue to go regularly to WDW, but do it cheaper. We investigated the DVC but thought it was expensive. 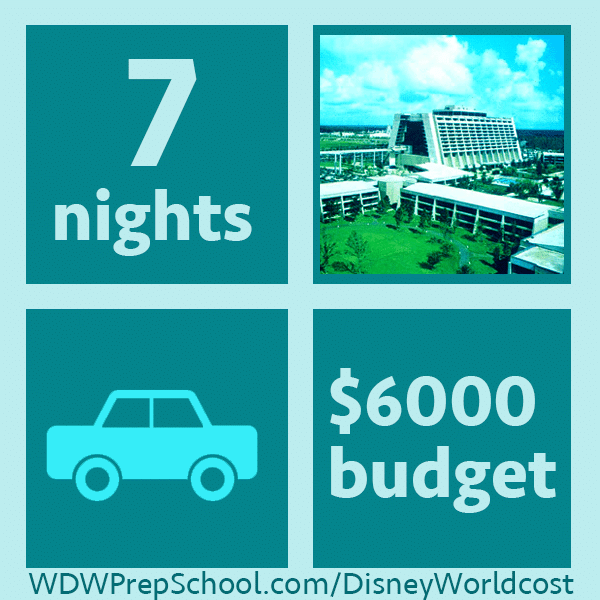 However, after working the numbers we realized if we were going to continue to go to WDW, the costs were adding up– and that is when the DVC made sense. After more research we decided to purchase after-market DVC. Why? Because it is half the cost of a membership purchased from Disney and it (at the time) had exactly the same perks. Also we didn’t need 40 years of points, only 30. So it made sense to purchase from a family who no longer treasured their membership. Now our costs are much, much better, and with the points we purchased we can go for 20 or so days a year. DVC provides a discount on annual passes, and instead of purchasing a meal plan we buy a Tables in Wonderland card, the cost with a DVC discount is $100. The Tables in Wonderland card gives us a 20% discount on food and drink, including alcoholic beverages! As I said, for us it’s a good value and was near the cost that we have spent for a single 7 day trip for two of us before. The only downside is that with the DVC you need to use the points regularly, but that’s no problem for us. I have heard a lot about TiW but am still fuzzy on the details. How exactly does it work — is it like a credit card that you use to pay for meals? We had a DDP on our trip just now, so I am comparing it to that. So our budget is very different than any of yours. We are a family of 4 from Canada, 1 under 10. We fly $500 each, $2000 total 14 days staying on site at a moderate hotel with free dining package. 10 day park hopper plus water parks and more, Halloween party tickets and La Nouba tickets $7050. Plus the Canadian dollar is only worth $0.73. We also are going to Universal for 2 days with meal plan and spending a day at Clearwater with the dolphins (about $2000) This is a VERY expensive holiday but we probably won’t go back again. Once to Disneyland(2013) and once to Disney World now it will be all inclusive hot holidays because it will be much less expensive to go to a 5star in Mexico! My budget looks quite a bit different that yours – we are a family of 5 (2 kids over 10) and we live in Idaho. A 40 hour drive each way is not possible, so we have to fly. Value on-site rooms are too small. We have to go during summer because of school schedules. 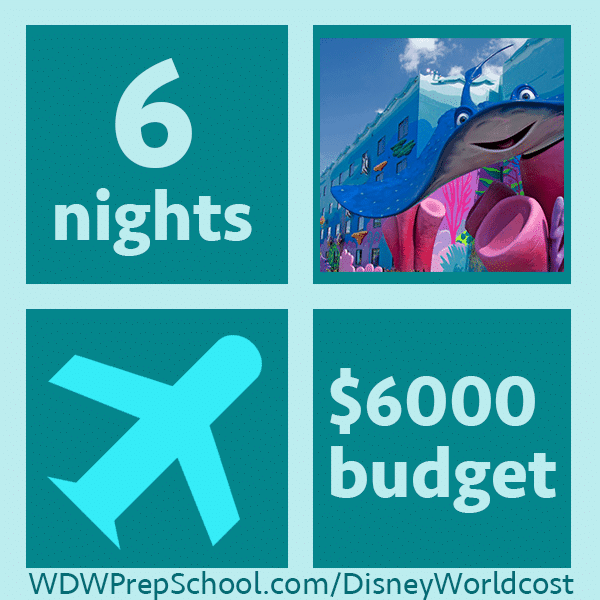 We are looking at $8400 – which feels like a pretty hefty price tag for a week of vacation. I really don’t want to stay offsite because we would prefer to not rent a car and want EMH. I supposed we could cut food, but again you almost need a car or stay somewhere with a kitchen to be successful at that. We are doing the same thing you describe (2 day park, one day at resort Art of Animation). Any tips for this being our first visit with an 8 and 3 yr old? Anything to hit, anything to miss? Lodging/park tickets: $1,730 ( booked as a package through Disney online) Includes: 7 nights at All-Star Sports, Free Quick Service Dining Plan deal and 2 adult 7 day park hopper with water park fun and more option. Probably should have purchased 5-6 day passes since Water Park & More attractions do not count against number of days. Great post, helps with realistic but creative planning! Here’s our usual trip budget for reference for others with our circumstances: We are a young couple with no kids, living in SC at NC border. We only sleep and shower in the room so don’t care if it’s cheap. And we eat at signature restaurants a lot of the time, we are foodies. We don’t really buy souvenirs or anything else while on trips, would rather save for next trip! Transport: $70 – we drive 8-9 hours each way in our hybrid. Accommodation: $200 – we find somewhere cheap but safe and clean on hotels.com for around $50-60 per night x 3-4 nights. Tickets: $250 – we bought annual passes and used them for 5 short trips, so our average cost was about $125 per person per trip. Food: $400 or so – we order pretty much whatever we want because our other costs are low. Food is by far our biggest expense coz we never have a budget in that area. Family and friends are jealous and sometimes bitter that we get to go so often, but its coz it only costs a few hundred dollars each time. 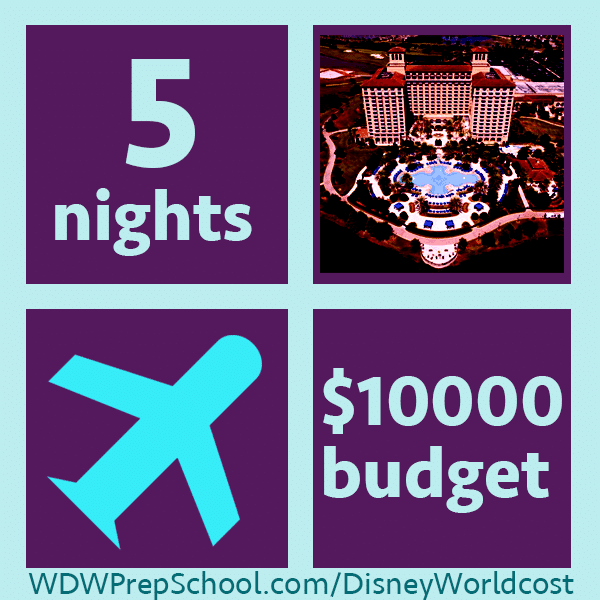 If you are willing to cut some corners and make a few sacrifices you can do Disney on a pretty tight budget! Great post of comparisons Shannon, you clearly showed how to choose where to save and where to splurge, according to each family’s priorities and personal taste. My husband and I and our 3 children are driving from Michigan to WDW for my daughters 6th birthday November 2015. We are staying at the Polynisian Resort on the Monorail with the deluxe dining plan along with 5 day park hopper passes. Our bill to WDW is 4800 dollars. Flying right now is not possible with our peanut allergy child (accidental reaction 5,000 miles in the sky is bad news) and even if we did fly, tickets 5 people could eaisly cost us 1800-2000. We would rather spend that on vacation. I should add that if you have a child with a life threatening food allergy, Disney is one of the few places that welcomes and accomdates families. (Chefs come to the table and take your order, they prepare your food seperate from everyone else, Disney Allergy Menues and careful cleaning of hotel rooms prior to your arrival) We have an AWESOME Disney Agent who is also part of the allergy community who is making a Dream Come true trip for our family. As far as the souvenirs, I always check out dollar stores, the dollar section at Target, the Disney Store for clearance items, etc. before we go to Disney. I buy a few little things to give our kids each day of the vacation and then allow each child to pick out one souvenir while we are there. It takes a little self-control (I want to buy everything while there) but saves a lot of money in the end. My adult daughter and I will be visitingDisney World (my 22nd visit) this summer from August 26 to 31. I am a Disney Vacation Club Member. Is there any way to take advantage of the free Dining Plan if it is again offered? We are planning a trip to Disney World in 2017 with our children and grandchildren. There will be 18 of us altogether, provided there are no new additions between now and then. The group will be made up of 10 adults, 1 teenager and 7 children (ages 5 to 11 at that time). Some may be driving and others flying since we will be coming from 3 different states to meet up. Any suggestions on where we could all stay together? Are there any large condos or houses that would accommodate so many people? We would also appreciate any tips on tickets, dining, activities, etc. What is wrong with us. 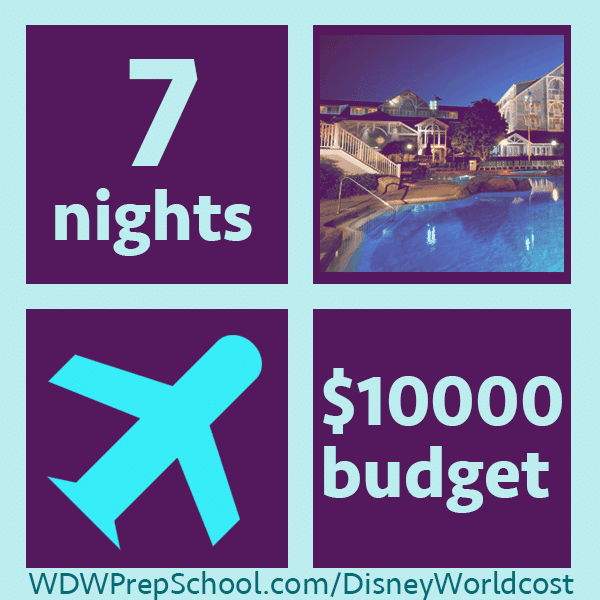 Can a family of 4 kids(10,12,12,16) and 2 adults, with a monthly income of $6300, go to Disneyworld? If so, what are we doing wrong with our money? Both house and cars are paid for. Help. 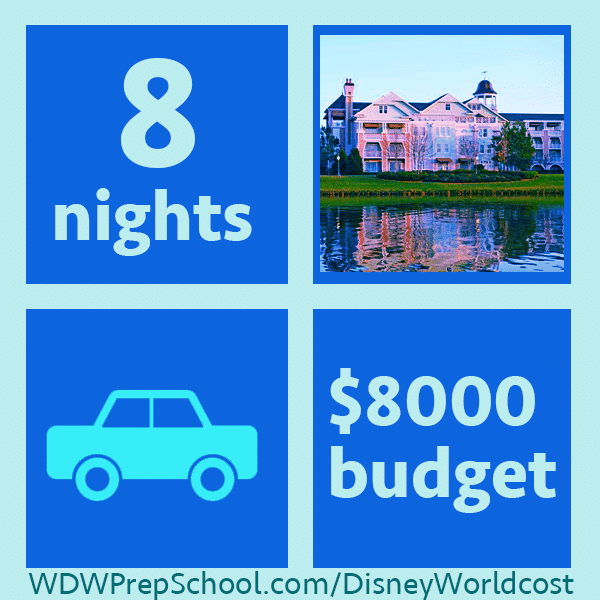 OK, so you’re saying your cars and house are completely paid for, and you have $6,300 per month, which adds up to $75,000 per year, but you can’t find the money to go to Disney World for $10,000 – $15,000? To me, this can only mean one thing, and this is assuming you have no other costs except for living costs, saving for kids’ college, retirement, etc., but I’m pretty sure you can max out on all those items, and still do this very comfortably. As I alluded to, your question probably means one thing, and that one thing is you have no budget, nor do you follow one. Everything you buy is on a whim, you don’t shop sales, there is no accountability financially, and so on. “You Need a Budget” is budget software that could help you, but you need to stick with it. Dave Ramsey (www.daveramsey.com) has a way to look at finances that blows everything away that I once believed regarding debt, credit, loans, getting on top, and staying there. I would suggest it all. Good luck. T.C. is spot on. Dave Ramsey’s Financial Peace University saved my marriage! And we are going to Disney now stress free. We are wanting to go in October to take our 6 yr old son for the first time. we only want to go to the Magic Kingdom for 2 days and Animal Kingdom for 1 day. 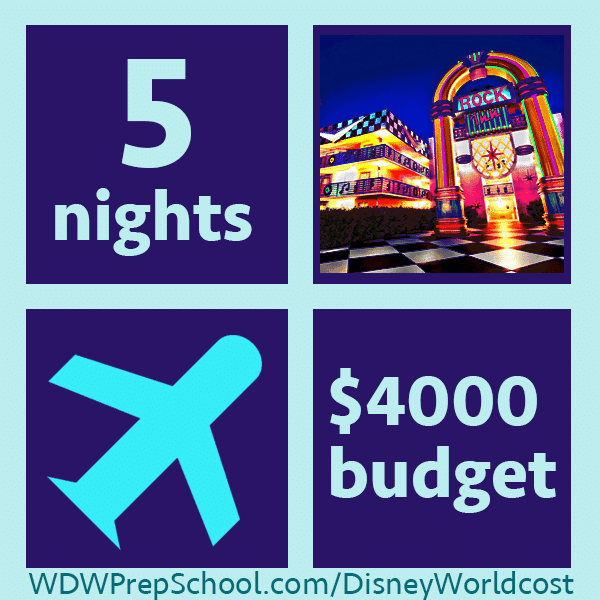 So, basically staying 3 nights/4 days…what is the most affordable wdw resort to stay at? Where do they offer teacher discounts? and do they have websites for discounted park tickets? Any help would be greatly appreciated! When a road trip is involved in a vacation, that’s part of the fun and family time together. Plan fun activities and stops along the way. I don’t think that that time is a chargeable item. Current upcoming trip plan November 2014- 2 Adults, nonstop airfare, Park hopper, dining plan,Wilderness Lodge standard room, Keys to the Kingdom tour, MVMCP $4000 (Souvenirs not included). I have been to WDW 3 times, planning my 4th trip for November 2014. This is the first time I am using a travel agent specializing in Disney-totally the best idea ever. I felt like I had to be knowledgable the other times, and this time I can sit back and enjoy the planning more. This is also going to be my first trip NOT using the delux dining plan (3 table service, and 2 snack credits), and am using the regular dining plan (1 quick, 1 table, 1 snack). I like the delux plan because you really don’t have to think about anything. If I wanted to plan a meal-I could. My daughter and I had 9 character meals in a 6 day/5 night trip (took each daughter for a mommy and me trip for 2 of my vacations). I know I am going to save money this time-even though I plan on paying for some extra table service meals, but I miss the ease of the delux dining plan-I got spoiled. ok, I’m replying to my own comment. again. I’ve done some more research as suggested by Shannon… and it turns out that the DVA might not be the greatest thing. It is relatively new and seems like there are A LOT of issues to work out that might actually turn it into a nightmare for some! DOH! Hopefully, the bugs will be worked out soon. I recommend doing some thorough due diligence before signing up. I’m glad I haven’t signed up yet. I included the website, but didn’t realize it was going to link it to my name- click my name (in red) to go the the Disney Vacation account website. (I’m not a disney travel agent or employee, I don’t get any compensation for referring people. I’m just a single mom trying to find all the ways I can to be able to afford taking a wdw vacation). Why would lost wages matter? Each family is obviously taking time off, and it’s assuming that their socioeconomic statuses are all the same. Question- we are Marriott Vacation Club owners and were thinking about trading out one of our weeks for one near Disney. Does anyone know which Marriott Vacation Club is closest? Is it even worth it to not stay on property? hoping to get to Disney World this summer. We have 4 kids ages 6 thru 11. Any recommendations on parks and hotels? My kids are not huge on thrill rides. They love the water – we have a pool at home. They will do one (or 2) and then lose interest. My boys are the oldest and into everything from nemo to star wars. My daughter who is 6 is not a girlie girl. She loves her some toy story! We also want to maybe do a day at lego land. All love animals and any super hero of any kind. Also thinking about driving but not too thrilled about 4 kids asking are we there yet for the trip from nj to fl. Also, any restaurants off the resort like steakhouses or red robin? are there coupons anywhere? -we are a day’s drive from FL but are staying an hour away from WDW in a cheaper hotel the night before so that we can arrive for a full day the next day. Love this! I want to take my family this April! Just don’t know where to start with all this planning and booking! Chuck – I stayed at the Orange Lake Resort (Holiday Inn Vacations) in Kissimmee a 2-bedroom villa suite in April/May 2013 and LOVED it! I am going back again with my family this June. We are renting from a timeshare owner via redweek.com. Good luck! great summary , love the different scenarios, Planning a trip in August with 11 year old grandson and 3 adults….Are there vacation Condo’s that you would recommend? My family and I have stayed at Liki Tiki Village many times. 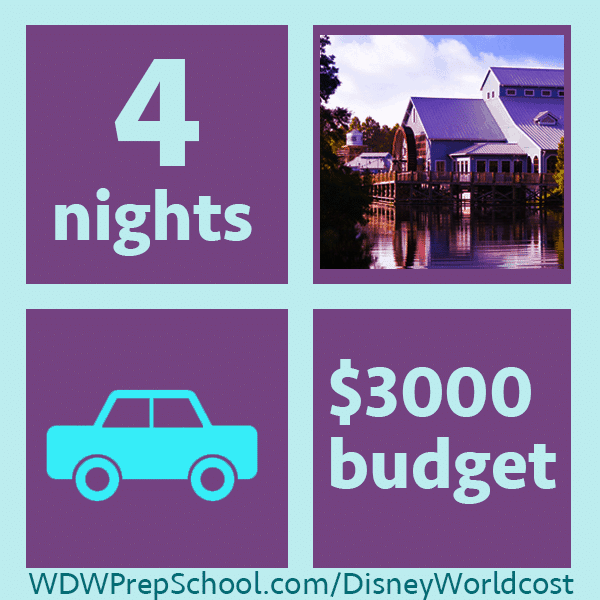 It is about a 15 minute drive (you will need a car) to Disney. It is a great place and very affordable. They are all little condo’s with full kitchens and laundry in the condo. The resort is nice too….swimming pools and activities. What a great resource! For our upcoming trip in June 2014, I already have airfare, rental car, hotel, and park tickets purchased, so these are the “knowns”, but I am struggling with some of “unknowns” — mostly the food budget! I can look at menus all I want and guess where we are going to be at any given time, but the question is: how do I not over-plan every single meal and food decision (we are not staying on site and thus no Disney Dining Plan) but still accurately plan a reasonable budget for food? There are 5 of us – my husband and me, two 13-year olds and an 8-year-old. There are a couple meals I definitely want to “splurge” on and already have ADRs for, but I’m not even sure what is reasonable for the rest of the food budget. Anyone else have this problem? Any suggestions would be awesome! So I have been working on this budget and here’s what I’ve come up with: I have 3 nice table service ADRs planned, we plan on eating breakfast in the room (suite has a full kitchen), and then of the remaining meals, about half will be counter service in the parks and half will be outside of the parks (a combination of fast food and sit down restaurants). Therefore, I am estimating my top-end budget should be around $200 per day for the 5 of us. Does this sound reasonable? I love your site! So helpful, and well done. My family of four; 2 adults, and twin girls (6), are going to Disney for the first week of December 2015! It sounds so far away, but in Disney planning time, not really! My husband and I have been to Disney before, but never with our kids. We are super excited, and I’ve been planning like crazy. After running many scenarios of what it would cost to stay in value, moderate, and deluxe thru Disney…discounts included too…I was really shocked by how expensive it can get. Because of my background in timeshare before I became a SAHM, I did some research in those roots. I’m so thankful I did. I was able to nab a great timeshare deal with BlueGreen Vacation Club, and we’re planning to exchange into the DVC thru RCI. We’re hoping to get the Wilderness Lodge, but will be happy being on any Disney property. We needed to join a vacation club anyway, to save money, and this will save us serious Disney money. We will have access to all the perks of being on property, which the DDP was something we really wanted. Plus, because it’s at the DVC, we don’t have to make it a package and buy our tickets thru Disney…I’m leaning toward using the Undercover Tourist for our park tickets. I believe we’re looking at a savings of around $2000 by choosing to go this route, plus we have a vacation ownership that we will use for other trips too. Great website and incredibly useful. Thank you! I must have about a dozen different tabs open, all with information from your site. 🙂 My family of four moved to Ft. Lauderdale from Ohio back in August. Our extended family and we pooled our holiday gift money to buy four yearly passes! We used gift money as the down payment and the rest we pay monthly so it doesn’t hurt the wallet too much. So far we have only used the passes to go to Epcot as a day trip, but found the 6 hour round-trip drive too much. Also, we went on January 20th, and the crowds were pretty heavy. Now…I am in the midst of planning a trip for Feb. 4-7. I am pulling the kids out of school because of the predicted light crowds. We’re a “Frugal Family”. I am, admittedly, horrified at the prices of Disney hotels! I lucked out and found a good deal on Groupon for a Walt Disney World Good Neighbor Hotel. That is good enough for me. In addition, I just went grocery shopping to purchase food for the trip. We don’t plan on eating any meals or snacks in restaurants. It’s just not in our budget. I spent about $260 for groceries, and some of that was “convenience” items, like V8 in cans, or tuna and chicken in ready-to-eat pouches. I feel like I’m going camping…but camping in a hotel room. Which is my kind of camping. 🙂 My one huge splurge was going to the Disney outlet store at the Sawgrass Mills Mall in Sunrise, FL. I bought three Disney t-shirts apiece for my daughters and myself. Matching. My husband refuses to participate in that weirdness. 😉 I am CRAZY excited about the trip. I’d live at Disneyworld if I could. We are planning a trip for our family of 7, kids will be 13,11,8,2, and 1. We want to stay in park and go in the summer…where is the best place to stay with a large family and is the free dining plan available for the summer? We will be driving to Dallas, TX to fly out of DFW, as this was cheaper than flying direct from OKC. Booked our flight with Spirit Airlines for around $200/pp ROUND TRIP! Bought our hotel off Groupon for around $400 total. We booked a rental car using our airline miles from past vacations and paid $0. Our WDW tickets were purchased through “Undercover Tourist” and that was around $1100 (saved us a little of gate prices). We are planning to only eat at the parks once or twice and nothing requiring reservations. Every other meal will be quick and easy. We are planning to purchase a $50 WDW gift card from Walmart for each child to spend on what they choose and that will be it for gifts. Adding to a total of around $2400 (not including our quick meals daily). Again, this is for a family of 4 for 10 nights and 11 days. Coming to around $55/pp per day!! We are a family of 4 going in mid-January 2014, with kids aged 12 and 14. We are staying 4 nights/5 days at Art of Animation Resort with 5-day passes (no park hopper) and planning on doing a half day in the parks both the day of arrival and day of departure, flying from Columbus, OH. No dining plan, as our kids are kind of picky eaters. We plan on shipping some snacks to save some money and we have one dining reservation at Hollywood Studios, but still plan on spending $500-600 on food. Not planning on a lot of $ for souvenirs, but I still expect it will end up being $150-200. So we’re looking at a grand total between $3400-$3500 for everything. I guess I would consider us a mix of moderate and frugal. I am reading to make sure I didn’t over pay but I feel like I got a good deal. We are going for 2 weeks (13 nights) to Orlando, staying at a trip advisor’s number 1 rated family resort (Floridays). We picked this place because it has a kitchen and two bedrooms, our son still likes warmed milk so we need a stove plus we want to be able to make our own quick meals. I cant imagine eating out for 2 weeks with a 3yo. The resort has sandbox, splash area and a pool so that will be nice for our son. 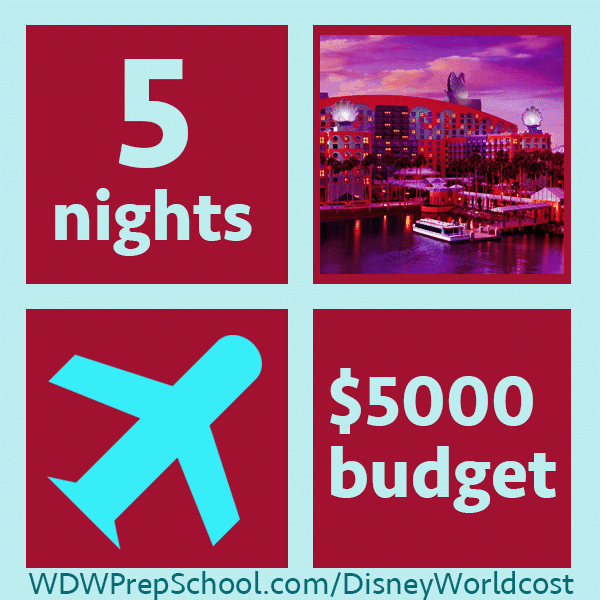 With savings deals we spent $3460 out of pocket now, this includes the most basic car rental, 3 plane tickets from Seattle to Orlando and the Hotel. It does not include another $190 the hotel will charge us in resort expenses. I am okay with this because I will be using the in unit washer and dryer, kitchen, plus their shuttles to Disney World and other major attractions. This was the best resort deal I can find, they are running 60% off promo for the hotel right now through travel sites. Right now we are out of pocket the 3460 I mentioned (hotel, flight, car). Food (300-500) We will probably eat at attractions so this will take some $ but we will also eat often in our hotel and pack fast lunches. I am just planning this budget range. When eating at restaurants, I usually share my meal with my 3yo. We only order water to drink and “cheaper” meals. Fun (1000-1200) We plan to go to 3 different parks, we will enjoy lots of free things like different beaches. I am guessing this cost, I will research groupons, call Costco (sometimes they sell resort tickets), basically research to get the best deals on tickets in advance. That’s around another 2k on top of what I already paid. I love this my biggest thing right now is I know how much its going to be for the trip and the room I need to know for a family of 5 how much extra money should I bring with me if we have a dinner plan that gives us 3 meals and 2 snacks and refilled cup. I have 3 kids ages 5,6,9 at time of trip and then my husband who likes things. so I was planning my trip but need to know how much extra money to take what is the lest amount of money I am thinking somewhere from 2,000-5,000. I’m trying to plan our first trip on a budget and I’m hoping to be able to squeeze it for $2000. We’re a military family living in Pensacola and we’re moving next summer so I want to be able to go to WDW before we PCS. There are six of us (but one of us is only one so at least she’ll be cheap!) I’m budgeting to use the military four day park hoppers at $169 a piece and I’m looking to stay off site because even Shades of Green can’t give me the kind of deal that I’m finding at the vacation homes with washer and dryer. We’re driving from Pensacola (6-7 hours depending on how many times the kids have to pee) and we’re hoping to go in Feb for moderate crowds. I want to just do one character dining experience and only eat lunch in the park. I’m hoping I’ll be able to manage since we really don’t have money to burn. I already feel nine months behind since I just started planning for a trip in Feb. Your site has been so helpful but now I’m worried that we won’t be able to hit all the rides my kids want. Yikes! I didn’t know it was so much work to plan this vacation! We used blueribbonmanagement.com to find our accommodations. They had a 4 bedroom condo with 3 1/2 baths and a full kitchen plus washer/dryer for $100 a night when we went the last week of February 2013. It was only about 10 minutes from Disney, and since our vehicle was parked right outside our condo door (we drove down), I think that put us as close to Disney as the people who stay in Coronado Springs, but have to walk 10 minutes to catch the bus or get to the parking garage. I’ve helped many of people as I build these packages, I always recommend Allegiant Air as they’re almost always cheapest and only do direct flights (though they don’t seem to run everyday) and places like timeshare resorts when on a budget cause it does save a bunch of money. If you got money to burn a 2 bedroom place on Disney for $1100 a night is fine, but if your spending that a night you probably have your secretary book your vacations anyway. Great breakdown I did laugh a bit at the crossed out section. In November 2013, we are staying on-site at a Moderate (Coronado Springs) for 6 nights/7 days, with park hopper, and we got the free dining package that includes table service meals (we are doing several character meals). Our bill to WDW is $2400. We are driving from Illinois in a fuel-efficient car, staying at a hotwire hotel (under $50/night) each way, eating on the road and also buying some snacks and probably a couple souvenirs, so hoping to keep it around $3000 total. Did you book this directly through WDW’s site? I would LOVE to get this same price. Was this for a family of four? Hope you had a great trip. How many were in your group? We are a family of 4 going to Disney for our 1st time in February. Would u recommend staying at Coronado springs? Totally love this post! I have booked an 8 day trip with dining plan and hotel stay. Anyways , I was worried because I thought a $1500.00 budget for souvenirs and the occasional extra like Bibbity Bobbity Boo Boutique was to frugal. We are a family of three, thanks for putting my mind at ease! You left out Value Resorts. They usually have better buses than moderate, great atmosphere (if you’re a kid), and allow you to have access to Extra Magic Hours. My family which I would call the Disney on Budget is going in June 18-23, seven nights, dining plan, stay at Art of Animation Little Mermaid Rooms for $3100.00. I budgeting $500.00 for travel, which is a sixteen hour trip from KY with a night on the road both ways. We have 3 kids 3,7, and 10. We want a deal but we want to stay at the park. What is the best deal for 5 people? 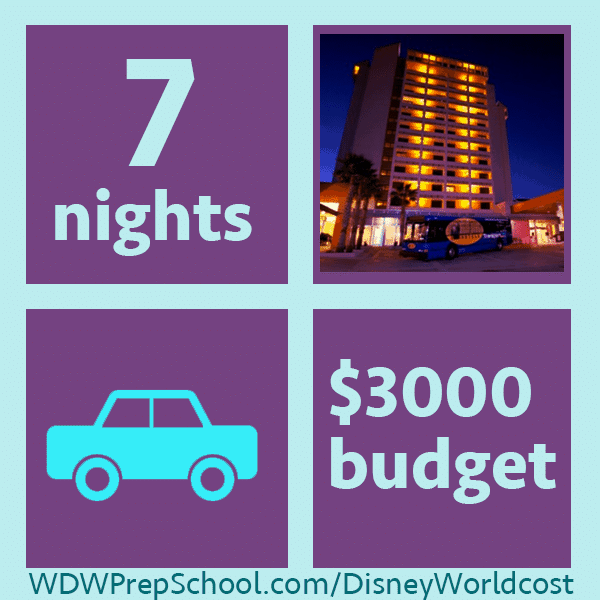 Is it staying in 2 value resort rooms or finding a wdw resort that can have 5 to a room? Port Orleans Riverside has a trundle bed that helps the rooms support 5 people for the same price as other 1 room moderates like Port Orleans French Quarter. Also there are some new Suites at Art of Animation that can handle 5. But those are little pricier. You got a few options I’d say. Look at some of the hotels on Disney that aren’t owned by Disney. Near downtown Disney there are a few and they still offer Disney transportation that runs often but normally are a bit cheaper than Disney owned and operated stays. With 5 people your in a sticky spot where you can get a roll away bed or have someone sleep on the floor (which I don’t recommend), or look outside that magical barrier at multi-bedroom places. Bunches are around that still offer transport if you need it and still have great on-site amenities. LBV resort village and spa is a personal fav, but look around there is great stuff around Disney just check the reviews cause photos can lie sometimes. You’re in another country and doing 2 weeks instead of 1. Totally different situation. I don’t agree with Hayley at all. I’m from Canada’s East Coast and two of us went for two weeks for just over $6,000.00. This included park tickets with the hopper option, we stayed on the Disney property and had the standard meal plan. This cost also included our travel insurance. We got a local travel agent that specialized in Disney and she was able to save us quite a bit. I’m from Nova Scotia (east coast Canada) and I paid just over $6000.00 for two weeks for two people. We stayed on Disney property, included the park hopper and opted for the standard dining plan. This cost also included travel insurance. Thank you for the round-up. 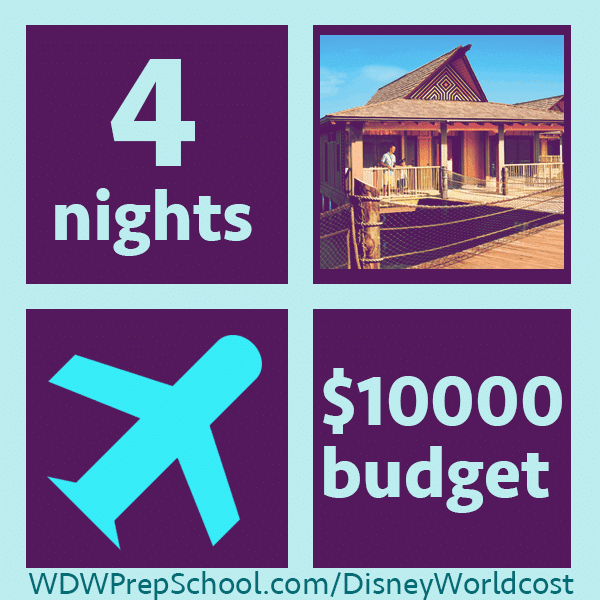 I have been looking for such detailed budget idea in planning our Disney trip. We are planning to go on 2015 or 2016 since our children is still young to go (4 & under) I know prices will change by then but we are now trying to save for this vacation. And this post really would help. I love it! Just what I was looking for… we are planning a trip for 10 and this was really helpful coming up with a $ goal. Thanks!